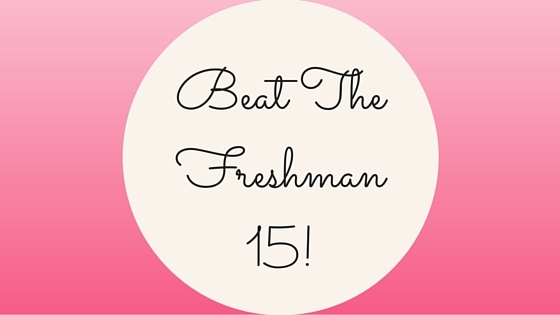 Modern Beauty Girl: Beat the Freshman 15! The freshman 15 is one of the biggest myths out there! It is very individualistic because obviously some people might gain more than others, but I wanted to share some of my tips to beat it! I'm only a month in to college, so I will definitely do an updated one in the spring with the start of a new semester! Pretty much all of my classes are upstairs. It can be really tempting to take the elevator instead of climbing all those stairs with your backpack, but try your hardest not to! I pretty much take the stairs all the time unless I'm carrying groceries or something heavy or going to my Chem lab because that's on the fourth floor! Also, if you have a iphone or apple watch, you can track your flights climbed to help you stay motivated! My school has a huge campus, so walking has definitely kept me from packing on the pounds! I average around 8,000 steps a day without going to the gym, but depending on what classes I have, it can get up to 15,000 or more! Walking is definitely a great way to keep from gaining weight! I know the gym isn't for everyone, but by just going once or twice a week, you're doing some great things for your body! For me, personally, I like going to the gym for weights because I get pretty decent cardio running to and from classes! If you're worried about gym etiquette, or being excessively hit on, don't be! Everyone's there to get stuff done, and don't let your self consciousness keep you from that! Drinks are one of the biggest sources of hidden calories! I don't restrict what I drink at all, but I am very aware of it! I usually refill my 16 ounce water bottle three or four times a day and have a cup of coffee and a diet coke. Make sure you stay hydrated, but also make sure that water is what you're drinking the most because it's the best for you! Do Eat Your Veggies and Fruits! I've been trying to eat vegan as much as I can because it helps me prioritize grains and vegetables, which are super important for health! It doesn't matter if I'm eating pizza or a burger I always make sure I either get a plate of salad (spinach, beet, cucumber is my fav!) or a plate of the steamed veggies of the day! It's really easy to be overwhelmed by the options each day and end up eating pizza or a burger. For me, I always like to start in the section with the freshly prepared foods so I can fill up most of my plate with the vegetarian dish of the day and some grain, then move towards the unhealthier stuff! If you have some time to eat, try taking a walk around to really see what looks good instead of getting into a habit of pizza and fries! Do Eat What You Want! I am very against restriction. I hate it, and I believe that you should eat whatever you want whenever you want. Don't go overboard, but if you want pizza GO FOR IT! If you want ice cream, GO FOR IT! I literally have ice cream once a day, but I eat clean besides it so it's fine! So, these are my top tips! I hope that this is useful for you, and if you're in college, leave your tips for beating the freshman 15 below! Please follow this blog on bloglovin if you aren't already to see lots more posts! As long as you are conscious of your movement and food (like your tips suggest) it's definitely possible to keep off the freshman 15. Most people put it on too from binge drinking, so it is definitely important to watch the alcohol. I was one of the weird people who actually lost 15 pounds over my 4 years of college but probably because I actually had to walk to get from class to class and back home only drove everywhere! yes definitely! you make a good point about binge drinking too! I think a lot of people forget that alcohol has calories too! Its great that you are already being conscious about this. It happened to my baby sis and took her 5 years to get it off. EEK!